Earlier this week I made two large aviation photography prints; the first one was a 130 cm wide canvas of my recent DC-3 Dakota shot. The second one, a large black and white print of this 1936 Lockheed 12A, made at the 2011 Sun 'n Fun fly-in Lakeland, Florida. The aircraft underwent a 19 year long restoration and first flew again in 2007. This beautiful aircraft which appeared in the movie "Amelia" is in pristine condition and has won multiple awards at fly-ins like Airventure and Sun 'n Fun. One can clearly see yours truly in the reflection of the spinner. The detail in the print is amazing! The original color image can be found here. On a different note, in a few days I'll be off the the French Pyrenees to do some more paragliding. More than likely my Pic(k) of the week will be late by a few days... Expect the 31 one around August 5. Pretty much the whole world knows where the worlds highest tower, Burj Khalifa stands! What most people don't know is that the highest hotel can also be found in Dubai, just a few blocks away from the 828m skyscraper. The Rotana Rose tower (333m) which opened officially end of 2009, is presently the worlds tallest hotel. However it is planned to be overtaken end of this year by the Emirates Park Towers (not to be confused with Emirates Towers!). 365m, Will be the new limit. The dynamics of Dubai. 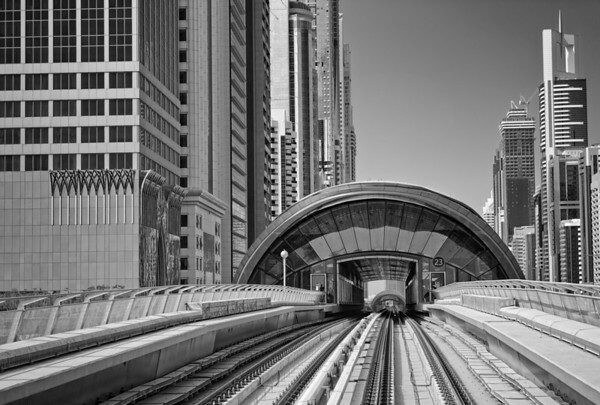 Last Sunday I finally managed to do something I wanted to do for some time; jump on the Dubai Metro and make some black and white cityscapes! It actually was my first time on the metro which was officially opened on 09.09h 9-9-09. The first line (Red line) which partially goes underground and mostly uses elevated viaducts, was built in about 3 years. Quite an achievement! The image above was made along Sheik Zayed road, a two times 7 lane highway, full of new skyscrapers where I spend my first 4 years in Dubai. Actually the building on the left (UP Tower) is the one where I initially moved into 9 years ago, while the one just before the skyscraper with the pin on its top (Chelsea hotel), was my home for more than 3 years. Even though construction in Dubai has slowed down quite a bit due to the Global Financial crisis, it continues to amaze me how most of the buildings on the image above, were not even there when I moved to the "City of Change" less than a decennia ago! The ones following my photography, will have noticed that my recent personal architectural images are more and more Black and Whites! Some of them can be found here. Don't just take images, make images! Pic(k) of the week 27: What is he photographing? It is however perfect to catch up with editing non-processed images from the last few months, including a large batch shot in Andalusia, Spain. While strolling through the streets of Jerez de la Frontera, I was about to make an image of the beer & snails sign on the left, when a curious waiter was wondering what I was up to. A few seconds later I clicked the shutter again and walked off with a interesting image. Street photography at its best! After editing a single file HDR (High Dynamic Range) with my new HDR favorite, HDR Efex Pro, I used SilverEfex 2 to convert to Black and White and spend quite some time fine tuning shadows and highlights. For the ones that shot film, "dodging and burning"!